Did you know? 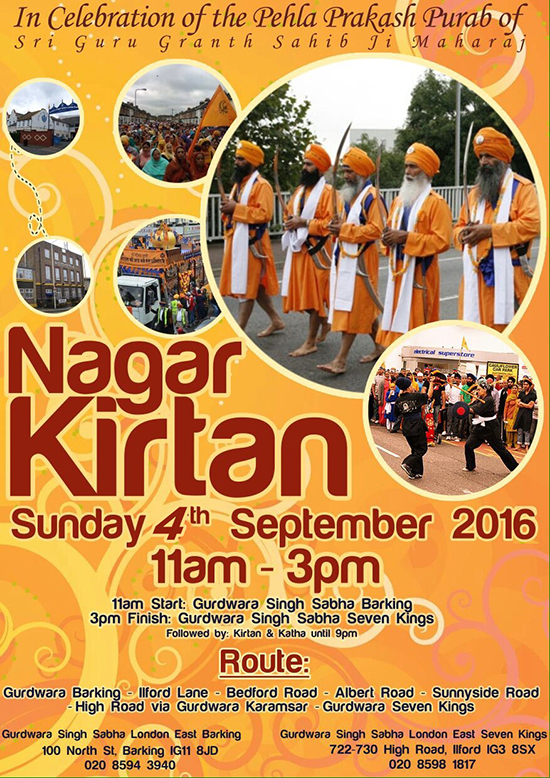 'Nagar Kirtan is a Punjabi terms which literally means "Neighbourhood Kirtan". The word "Nagar" means "town or neighbourhood," and "Kirtan" is a term describing the singing of Shabads (divine hymns). The term refers to the possession of Sikh Sangat (Congregation) through the town singing holy hymns. The concept of a Nagar Kirtan is to bring the message of God to the doorstep of the community. It is very common for Nagar Kirtans to take place wherever Sikhs live. They especially common during the month of Vaisakhi and take place all over the globe. In celebration of the Pehla Prakash Purab of Sri Guru Granth Sahib Ji Maharaj. Sunday 4th September 2016, 11am to 3pm. This is followed by Kirtan and Katha until 9.00pm. 11.00am start: Gurudwara Singh Sabha Barking. 3.00pm finish: Gurudwara Singh Sabha Seven Kings. Barking Gurdwara - Ilford Lane - Bedford Road - Albert Road - Sunnyside Road - High Road via Gurudwara Karamsar - Gurdwara Seven Kings. We look forward to seeing you there. It's going to be a lot of fun. We are here to serve and strengthen our community. Matrimonial events every month from 6pm - 8pm.